The actors form a cohesive family unit. Roberta Wallach stands firm as the matriarch of the Horvath family, Margaret. Wallach creates a woman who lives in pain, but who is strong and relatively self-sufficient; however, as the play progresses and the emotional pain becomes too much to bear, the character gives in to the physical operation. Wallach reveals through this concession that Margaret has deferred some of her resolve to Matthew and Woody. Katie Kriesler, who plays the daughter Roanne, provides the closest resemblance to a nurturing character by cooking meals and standing up for her younger brother. At the same time, Roanne longs for her father’s approval and secures her place in the “family business” by starting a relationship with a philandering sheriff on New Years’ Eve. Woody, played by Lee Tergensen, supplies the brawn of the family’s operation. Woody is more or less in control of the business and any problems that arise. Tergensen never lets his character waver and keeps Woody single-minded and focused with one goal in mind: keep the family business together at any cost. Larry Pine plays the diminished “Godfather”-like character of Matthew Horvath. Matthew rarely gets his hands dirty and delegates most the criminal activity to his subordinates; the play illustrates this inequity when a boy is killed after being arrested for stealing a car that Matthew sent him to steal. 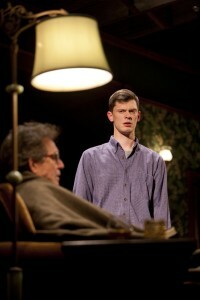 The play also alludes to the possibility that Cheryl’s death could be the result of her father’s dealings. Larry Pine plays a quiet, unsuspecting man who cannot handle the business on his own. Mr. Pine speaks too quickly and tends to stumble over his lines; this makes it difficult to sometimes follow the action of the play. However, his fellow actors support him beautifully and keep the story from getting lost. Karl Baker Olson, as the younger son Donny, endows the play with the lone voice of morality. Donny does not approve of his father’s callousness towards the deaths outside of the family and becomes disdainful when he realizes that his father is responsible for the deaths. Donny is a passive character, but the audience can’t be sure if this is by choice or necessity; the one time he speaks up in public he’s beaten. Karl Baker Olson plays a young man trying to find own identity within a constricted environment. While his character is not able to defy them, Olson displays an inner strength that keeps the character from completely losing himself under the pressure of his family. Bob Glaudini has created a play that Pat Conroy would be proud of. The Horvath family lives in a moral world of their own and value “family loyalty” above mercy or compassion. Yet, like The Great Santini and The Prince of Tides, people are drawn to the broken lives and desire to see the family struggle to stay together—even in severe dysfunction. 11/22/10. TNETG. This entry was posted in Drama and tagged 2010, Bob Glaudini, Boston, crime, December, Drama, dysfunctional, Huntington Theatre, Karl Baker Olson, Katie Kreisler, Larry Pine, Lee Tergesen, MA, morality, November, Peter DuBois, Professional, questions, Roberta Wallach by beccackidwell. Bookmark the permalink.